Commodore Perry Landing Monument. The Perry monument at Kurihama on the Miura Peninsula (Kanagawa Pref.) was built on July 14, 1901. It marks the spot where he first landed in Japan in 1853. Click to see what the monument looks like today. I wonder what happened to it during the World War II. Was it destroyed or left untouched? 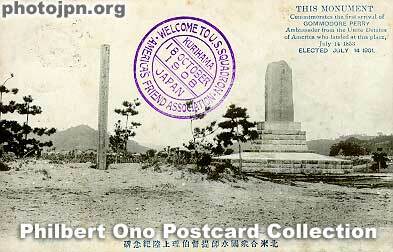 This postcard was made to commemorate the visit of the US Fleet in Oct. 1908. Yes, it is still there. I used to visit this site often on short motorcycle trips from the Yokosuka Naval Base, where I was stationed from 1976-1979. It is a wonderful memorial, left intact, I believe, during WW II. Is it true? Please let us have more evidence on the Net.